Asajj Ventress is one of my all-time favourite Star Wars characters. 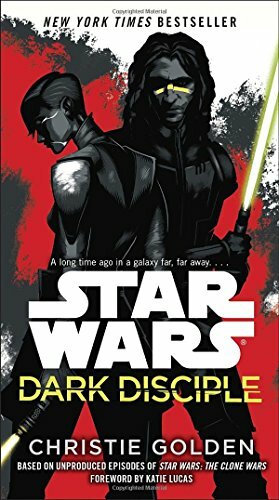 The Star Wars novel featuring her has been out for some time now (July 2015) so when I decided to give the novels a go her story was the first I chose. Before I give my thoughts on the book, please note there will be some broad discussion of the overall plot ahead. No spoilers though. The story is set in the last year of the Clone Wars, 19 years before the Battle of Yavin, in the same year that the events of Star Wars Episode III: Revenge of the Sith take place. The book focuses on Jedi Master Quinlan Vos who must team up with Asajj in order to complete a dangerous and dark mission set by the Jedi Council. The books premise highlights my main disappointment with the book itself. I had, maybe wrongly assumed that the novel would focus mainly on Asajj. However, the majority of the story is told through the eyes of Jedi Master Quinlan Vos and is in fact more his story with her as a supporting character. Therefore, anyone looking for a Ventress origin story told from her perspective will be disappointed. I also felt the book does Ventress herself a disservice. Instead of cementing her as one of my favourite characters by the end of the tale I found myself less connected to her. Even though she’s one of the main antagonists in the Clone Wars series I always liked her as a strong, powerful, self assured and self reliant warrior women. Unfortunately as this book progresses that image gets slowly eroded. Having said that the book does have many positive aspects. It further explores the issues of right and wrong during the Clone Wars, sees the Jedi Order treading dark paths and does not portray them in a particularly positive light. Also the overall adventure storyline through the Galaxy is exciting and interesting take the reader to familiar and new planets and quadrants. The book also brings new Jedi into canon and also expands the personality and character of the universe regulars. As always Jedi Master Obi Wan Kenobi is an engaging character. The downside of this being that he rather steals the show from Quinlan Vos. In conclusion: I enjoyed the book as an easy read which is entertaining throughout. Although it didn’t provide the in-depth Asajj Ventress adventure I hoped for, it did involve her enough that I wasn’t left disappointed. It’s also a good introduction to the Star Wars novels themselves and has spurred me on to read more in the series. So, if you are a Star Wars fan interested finding out more about the canon and background surrounding the films and cartoon series I would definitely recommend this book. I never ever seen star wars but by reading this, i am curious about it. That’s great, happy to hear that it’s sparked your interest! If you decide to give the series a try I’d start with the first film Star Wars (now called Star Wars Episode IV: A New Hope). If you can get you’re hands on the original version before the remastering all the better. Thank you for your comment, hope you check out my future articles. Excellent review. I really liked the way that you highlighted the way that the Jedi Order were operating more towards the 'darker' side of the force before their inevitable downfall: very thought provoking! Thanks glad you enjoyed the article and that it proved some thought. Totally agree, in the lastest film Luke Skywalker has some further thought on the Jedi fall which I also found interesting. Thanks for the comment, hope you’ll check out my future articles.